Germany’s foreign minister traveled to Ukraine on Tuesday in a bid to broker a dialogue between the government and separatists and resolve the fallout from a controversial referendum that could see the east of the country joining Russia. Pro-Russian separatists who called and oversaw the poll said an overwhelming majority voted in favor of splitting from Kiev and coming under Moscow’s rule. The United States, Europe, and Ukraine’s central government have all denounced the vote as illegal. 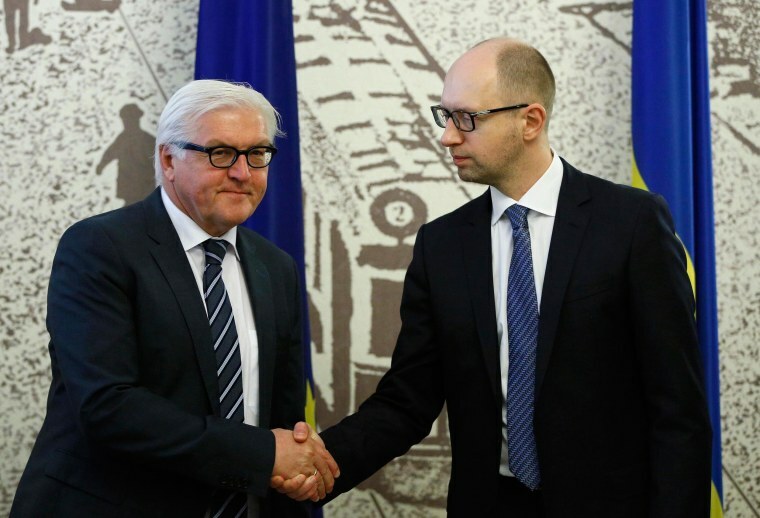 With a response pending from the Kremlin to the so-called Donetsk People’s Republic formal request for annexation by Russia, Germany's Foreign Minister Frank-Walter Steinmeier met with Ukraine’s interim Prime Minister Arseniy Yatsenyuk and Foreign Minister Andrii Deshchytsia. He said he hoped the trip would launch a quick "national dialogue" between the Western-backed government in Kiev and the Russia-leaning separatists in the east. His trip is aimed at implementing a road map for settling the crisis laid out by the Organization for Security and Cooperation in Europe, a top trans-Atlantic security and rights group, according to Reuters. Ahead of his visit, more conciliatory tones emerged from Moscow, which was hit by several rounds of sanctions from the U.S. and Europe after its annexation of Crimea. In a departure from the events of Crimea’s split in March the Kremlin initially said it had no response to the plea for formal annexation from the separatists. While it said it respects the "expression of the people's will," the Kremlin on Monday urged a dialogue between both sides.